From left: Dr. Adrian Tyndall, interim dean of the College of Medicine, Dr. Friedman, fellow inductee Dr. Jason Rosenberg and Dr. Kent Fuchs, president of University of Florida. Longtime neurosurgery chair William A. Friedman, M.D., now has a new title to add: inductee of the UF College of Medicine Wall of Fame, the college’s highest honor. Friedman, who completed his surgical internship and neurosurgical residency at UF, has served the university for 42 years and he led the Lillian S. Wells Department of Neurosurgery for the last 19. A professor of neurosurgery, he has retired as chair as of summer 2018 but continues as a practicing neurosurgeon. Among his many outstanding achievements, Friedman, the co-director of the Preston A. Wells Jr. Center for Brain Tumor Therapy at UF, pioneered the development of new radiosurgery technologies to treat a variety of brain disorders. 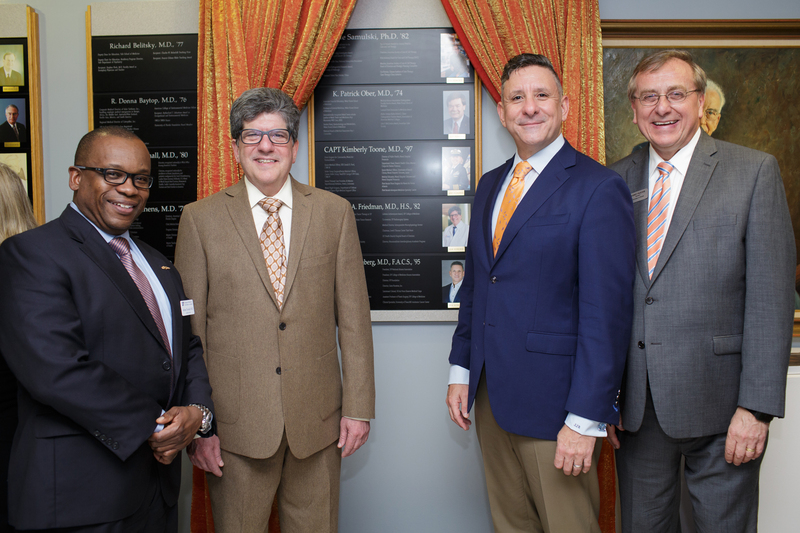 The Wall of Fame Award began in 1988 to recognize alumni of the UF College of Medicine who have made significant contributions not only to medicine, but government, education and the community.